We have a Mountain Yurt designed by Pacific Yurts. It is a 30 foot version which is the largest on the market. It is available to rent for families and groups. It is also available in the winter for a fun overnight option during ski season. 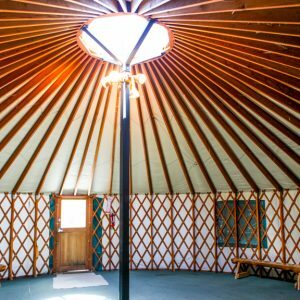 The yurt is a good option for groups of 30 or fewer. Our yurt sits on a very large raised Trex deck with several tables. It has a pellet stove as well as gas stove for heat. The yurt is well lit with additional exterior lighting on the deck. There is plenty of parking for bigger groups. It’s close proximity to our “Upper Lot” partial RV hookups makes a good fit for groups with some RV campers. There are no beds or sleeping facilities in the yurt. Most guests bring sleeping pads or cots. It does have a nice carpeted floor. There is a beautiful lawn surrounding the yurt and deck. No tents are allowed on the lawn please. There is an additional “cook shack” included with the yurt rental that is located right next to the yurt. In this kitchen there are a microwave, refrigerator, double sinks, oven and stove. There is a propane grill for guests use on the deck. There are no utensils or cooking accessories in the kitchen. There are also two restrooms in this building. The yurt is also very close to our larger restroom/shower building. It’s not uncommon to watch some of our local mule deer and maybe even a moose from the deck of the yurt in the mornings and evenings. Check-in is 2pm & check-out is noon.